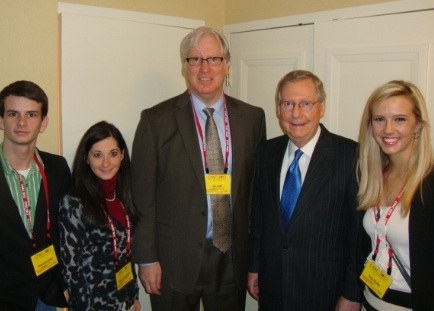 I met this morning with Senate Republican Leader Mitch McConnell during a breakout session at CPAC. Tina Korbe from HotAir, Alana Goodman from Commentary Magazine, blogger Brandon Kiser and Phil Klein were also at the meeting. I asked the Republican leader how hard it is to work with an the Democrat leader when he claims Republicans want arsenic and Mercury in the water? What he (Harry Reid) doesn’t wnt you to realize is that 12 democrat members agreed to the same mesasure. It’s a tactic. Obama held a signing ceremony in the middle of the night recently. Obama wants to continue the talking point that Congress is not getting anything done. The easiest way to overturn this is for the president to have an epiphany. Congress can send him a bill he signs. Or we get a new president. We want the election to be about what he’s done. He wants it to be about how Congress is not letting him get anything done. Senator McConnell then left to give his speech to the CPAC audience.